This Victorian classic is generally credited as being the first detective novel. The Moonstone is a large diamond of religious significance to certain Indians. Legend has it that a curse follows the gem. The story begins with a tale of the diamond having been wrested from India by a British military man. Eventually it is given to a lovely young Rachel Verinder as a birthday present. It goes missing that same night. Lurking about outside are some suspicious itinerant Indian jugglers. The occupants of the house include partygoers and family among the gentry and various servants, including one with a criminal background. The police are called and Sergeant Cuff, a renowned detective, is on the case. The book is a long one and many mysteries requiring solving: who took the gem and where is it now, who will win (or lose) Rachel's affection, what about the paint smear? All of these and more are eventually solved. I did not guess the final solution to the main one of the diamond. The plot is well crafted and it is a fair mystery. The cast of characters is large and the story is narrated by several of them in turns. I listened to it as an audiobook from Naxos. There are several versions now since the book is in the public domain; I can recommend this one. It is a long book, 17 disks, which is all the better if you are looking for something to keep you interested for a long drive or set of commutes. You may be taken aback by the blatant male chauvinism and class prejudice, but it merely reflects the views of its day. If you enjoy Downton Abbey or Upstairs, Downstairs, this won't bother you. If you don't, then you might want to rethink this choice, but I can tell you I'm no fan of Downton and still enjoyed this classic mystery. 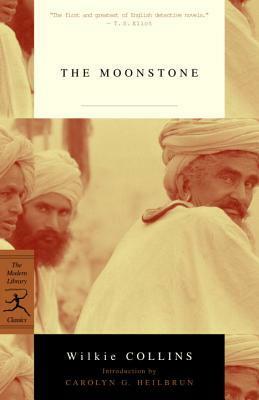 Sign into Goodreads to see if any of your friends have read The Moonstone.